Since early 2016, Age-Friendly Teaneck has built a network of supporters to work toward the goal of better serving the needs of Township residents of all ages. Some of Teaneck’s most-active government, business and civic leaders have served on our five task forces, which focus on creating more housing options, improving transportation and pedestrian safety, enhancing health and social engagement, educating business and banking leaders and increasing communication and access to community resources. In addition to its many local partners, Age-Friendly Teaneck is plugged into a network of other New Jersey communities with similar initiatives, all being funded by the Henry and Marilyn Taub Foundation or The Grotta Fund for Senior Care. Our alliances keep on growing. In June 2018, Teaneck Township became the first Bergen County community to join the AARP’s Age-Friendly Network of States and Communities. for rapid population aging. The program has participating communities in more than 20 nations, as well as 10 affiliates representing more than 1,000 communities. Why is the age-friendly movement taking root across the globe? 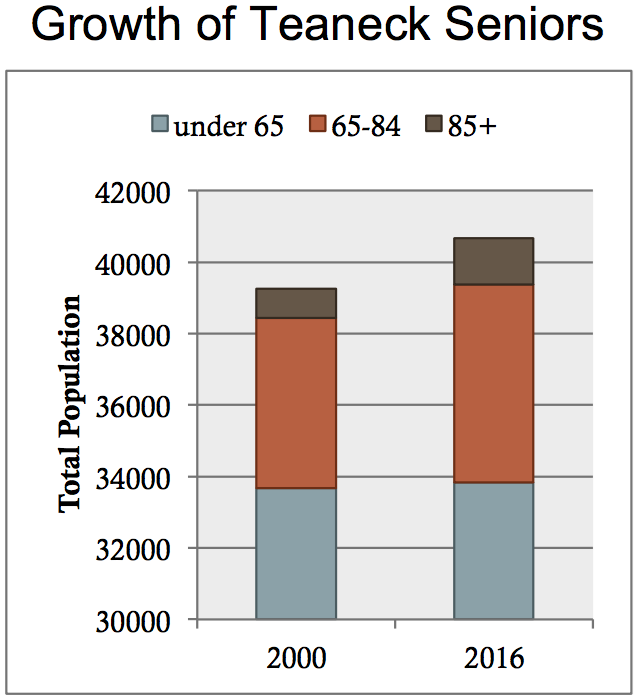 Because Teaneck -- like most of Bergen County, and most of New Jersey, and most of the United States, and many countries around the world -- is seeing its population age at faster rates and in higher numbers than ever before. By 2030, one of every five people in New Jersey is projected to be over 65. Teaneck is also trending older. The Township’s overall population grew 3.5 percent since the 2000 Census. Its senior-citizen population grew by 22.6 percent. 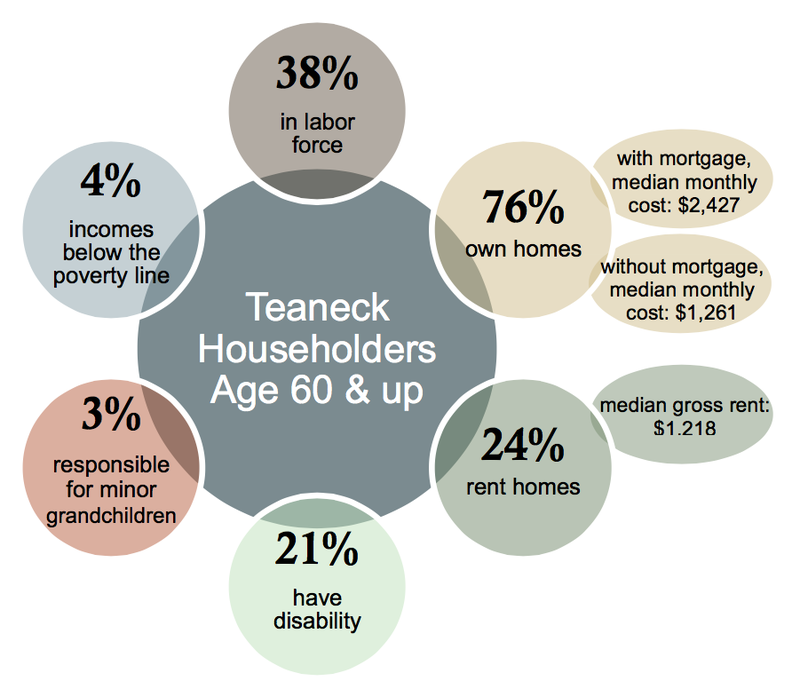 While most of Teaneck’s housing stock was built to serve families with small children, about 35 percent of households now have at least one person over age 65. Residents of all ages would benefit from a better mix of affordable and market-rate housing options, and residents of all ages would benefit from new developments being built within a short walk of stores and other businesses. The aging of Teaneck presents some challenges – but also creates some opportunities. Older residents are an asset to any community. Many lead civic organizations, serve on boards, and perform good works through their houses of worship or fraternal organizations. Teaneck can and does benefit from their vast experience. As we strive to make Teaneck a more livable community for all ages, we welcome your input. AGE-FRIENDLY TEANECK | Copyright © 2019. All Rights Reserved.